« How accurate is the TR jet derived Pulmonary artery systolic pressure ? A young man fell off the tread mill soon after complaining of chest pain in the immediate recovery phase. He had just completed 8 minutes of standard Bruce without any difficulty . Even as the defibrillator was being moved near him , he was successfully shocked with hands of a hefty nurse ! ( 25 joules ? ) . He got into this rhythm ! Note the ECG shows diffuse ST elevation . 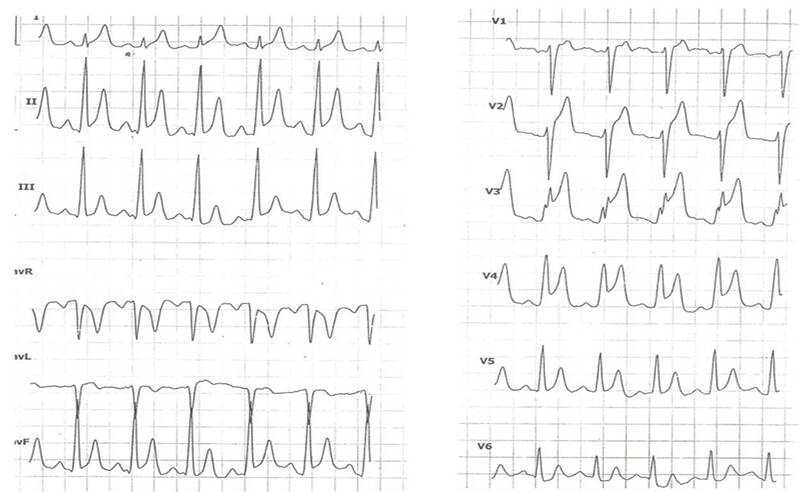 The ECG soon settled and a diagnosis of variant angina was presumed. He was shifted to CCU. There was no elevation of enzymes , though he showed a transient wall motion defect lasting up to 48 hours. The subsequent elective angiogram did not reveal any critical CAD favoring Prinzmetal angina. * The classical angina of prinzmetal is not related to exertion . Can we call this as a variant of the variant angina ? 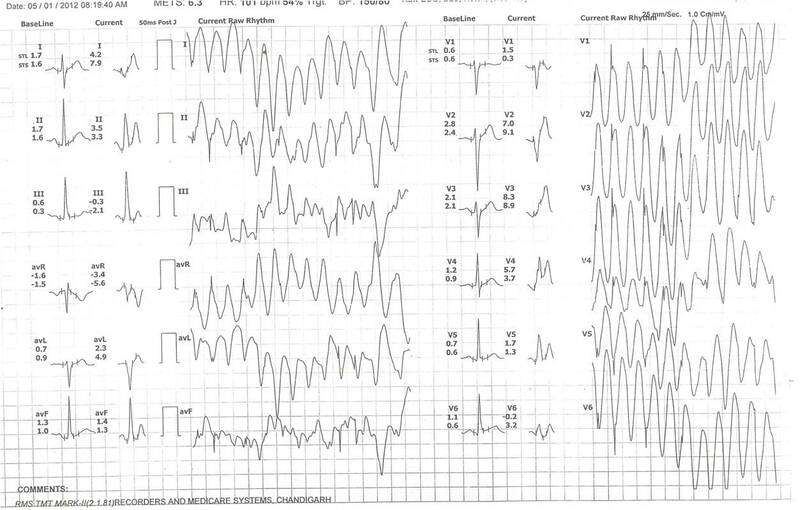 VTs are rare arrhythmias during EST. However , there are important link between exertion , VPDs and VT . Exercise induced RVOT VTs are supposed to more common. However , ischemic VT during exercise has to be ruled out in every patient. Non sustained VTs in patients who have baseline VPDs are usually benign . Paradoxically VPDs disappear in many during exertion indicating overdrive suppression by sinus rate .This again can be ignored. Mono morphic VTs would suggest structural defects. I’m really impressed with your writing skills and also with the layout on your blog. Is this a paid theme or did you modify it yourself? Anyway keep up the excellent quality writing, it’s rare to see a great blog like this one these days. through him as nobody else realize such exact approximately my trouble.